Given that anyone with ten digits and a piano in reach seems to record a Beethoven Piano Sonata cycle (as this survey suggests), it’s a little surprising that there are so few on original instruments. In print and available individually there's only one, actually - and happily it's by far the best: Ronald Brautigam’s on BIS. The others, because you were asking, are: Malcolm Binns, who only made it onto CD when Decca issued the “Classical & Early Romantic” 50-CD L’Oiseau-Lyre Florilegium box last year and Paul Badura Skoda II (on Auvidis Astrée, oop; $250/₤170 and a Japanese XRCD24 version is yours). To this list you can add Malcolm Bilson and assorted students of his on Claves (oop). Brautigam, meanwhile, didn’t stop once he had the sonatas under his belt, either, but continued to work his way through all the other ol’ Ludwig keyboard works, too, from famous (Für Elise) to rare (Rule Britannia Variations) to obscure (Two Preludes Through all Major Keys for Organ or Piano, op.39) and completed the project. The latter two are on this disc, volume 14. It’s a charming Beethoveniana, this disc, with five sets of Variations and various small pieces, greatly enhanced by excellent piano playing on a superb instrument. This is applied to quality music that has the glow of familiarity that the authorship provides, coupled with the novelty of aural discovery. The instruments of Brautigam’s, same as with his forte-piano colleague Kristian Bezuidenhout, are worth noting. Here he plays a 2007 Paul McNulty copy of a Conrad Graf from around 1819 … which, as virtually all Paul McNulty instruments, sounds so wonderful, fresh, and sound, that there is not a hint of ostentatious “historical-instrument-at-work-folks!” feeling. Without diminishing either of these two, or any other pianists', achievements, it is hard to imagine that the use of fortepianos would have broken - or might yet break - into the listening-mainstream without the standard that these instruments have set. Paul McNulty, with his meticulous pianos, has banned all copulating skeletons from corrugated tin roofs into the closets of the past. Back to the programme at hand. Who would buy a disc of such unknown Beethoven pieces? Despite the curiosity value of two national songs being Beethovenized, probably only the seasoned collector and the completists. That would be a shame. 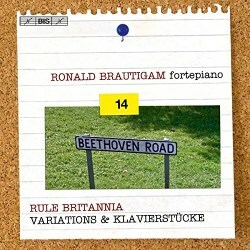 Perhaps we can add all those who have bought into and been bowled over by Brautigam’s sonatas. Still, that’s not enough. These works may be short but there is top-drawer Beethoven here. It might help to like Variations in general. I do; Mozart’s Ah! vous dirai-je, maman Variations are, perhaps perversely, among my most cherished Mozart piano compositions. Then again, it’s hard to see what’s not to like about them. Their natural, easy-to-follow structure and contained format - except when Beethoven busts that, too, with his Diabelli Variations - make for very gratifying listening. It tickles the ears and doesn’t strain the noggin. When the themes are of his own invention, we essentially get a stand-alone sonata variation movement. When the musical topic is well known, it is a joyous trip through the transmogrification. He doesn’t just tinkle a few embellishments onto the original but grafts his themes, even in small form, ever anew with every new go at it. The main theme switches tonalities. It switches from the upper to the lower hand and back. The rhythms are never the same … Beethoven imbued Variations with variety like no one had before. I could see either the Rule Britannia or God save the King/Queen Variations as a winking, apt encore choice at a Wigmore Hall recital. The shorter works could be inserted into Beethoven recitals to loosen the texture. The Ruins of Athens Variations - the Variations came before the incidental music - in particular make for a brilliant little earworm. The same can’t be said of the Two Preludes, which worm their way through all the major keys in zippy fashion - just about two minutes, for the second one. They were inspired by a young Beethoven’s working on Bach and his Well Tempered Clavier which Beethoven later deemed worthy of an opus number. Perhaps he hoped for them to be well-selling student material. Curious, and not without charm, but in this case admittedly non-essential Beethoven. The Minuet in E flat, true, is a Piano 102 favorite, but its piano-primer-use notwithstanding, it is cherishable music. It’s rarely played as well as it is here. It works almost as a little One-Two Sonatina together with the following Waltz in E-flat which has some extraordinarily charming moments. The Waltz must surely be in a different league from all the other waltzes of the multi-composer collection for which it was written. This BIS-release - the penultimate, methinks; as only the Diabelli Variations seem to be missing - and just about every other preceding disc in this series, is precious and will be loved by followers and newcomers to Brautigam’s Beethoven alike. The liner-notes (Roeland Hazendonk) are extensive and, more importantly, superb.